The recent interest in bioenergy has motivated a closer look at microorganisms from extremely high temperature environments. Not only do extreme thermophiles have the capacity to convert the carbohydrate content of plant biomass into fermentable sugars, their novel metabolic pathways could facilitate other important biotransformations related to bioenergy applications. 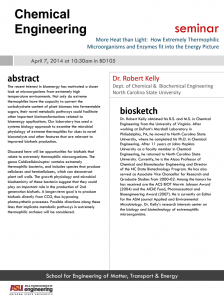 Kelly’s laboratory has used a systems biology approach to examine the microbial physiology of extreme thermophiles for clues to novel biocatalysts and other features that are relevant to improved biofuels production. 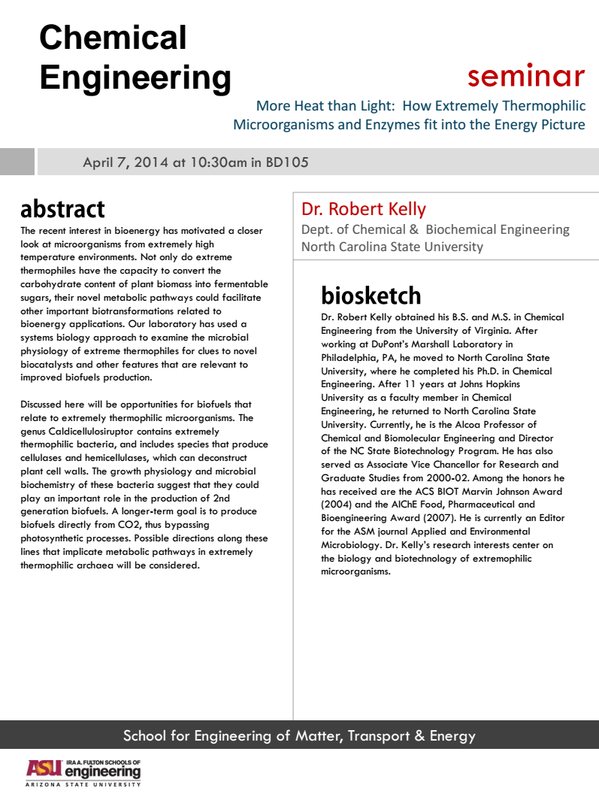 Kelly will discuss opportunities for biofuels that relate to extremely thermophilic microorganisms. The genus Caldicellulosiruptor contains extremely thermophilic bacteria, and includes species that produce cellulases and hemicellulases, which can deconstruct plant cell walls. The growth physiology and microbial biochemistry of these bacteria suggest that they could play an important role in the production of 2nd generation biofuels. A longer-term goal is to produce biofuels directly from CO2, thus bypassing photosynthetic processes. Possible directions along these lines that implicate metabolic pathways in extremely thermophilic archaea will be considered. Robert Kelly obtained his bachelor’s and master’s degrees in chemical engineering from the University of Virginia. After working at DuPont’s Marshall Laboratory in Philadelphia, Pa., he moved to North Carolina State University, where he completed his Ph.D. in chemical engineering. After 11 years at Johns Hopkins University as a chemical engineering faculty member, he returned to North Carolina State University. Currently, he is the Alcoa Professor of Chemical and Biomolecular Engineering and director of the North Carolina State Biotechnology Program. He has also served as associate vice chancellor for Research and Graduate Studies from 2000 to 2002. Among the honors he has received are the ACS BIOT Marvin Johnson Award (2004) and the AIChE Food, Pharmaceutical and Bioengineering Award (2007). He is currently an Editor for the ASM journal Applied and Environmental Microbiology. His research interests center on the biology and biotechnology of extremophilic microorganisms.